Back to the maths table, now with even more maths! We started with number to 10, then onto number to 20. Now we’re consolidating our knowledge of key addition facts as well. The game on the left is our doubles facts that we explored a few weeks ago and the game on the right is our pairs that make 10 that we learned in term 3. I already had all the answer cups I needed from the previous versions of the maths tables and remarkably none of the cups were that damaged! There’s not a day that goes by without one of the children in my class truly amazing me with what they can do with numbers. Some have developed a deep understanding of tens and units, others are great at spotting doubles facts and making connections between different things we have learned in maths. Sometimes there is pressure as an infant teacher to ‘move the children onto bigger numbers’ as they often arrive in P1 already ‘knowing numbers to 10’. I can’t help thinking the ‘over-learning’ around number concepts and tens frames that we did at the beginning of the year has given my class a firm foundation for number understanding. 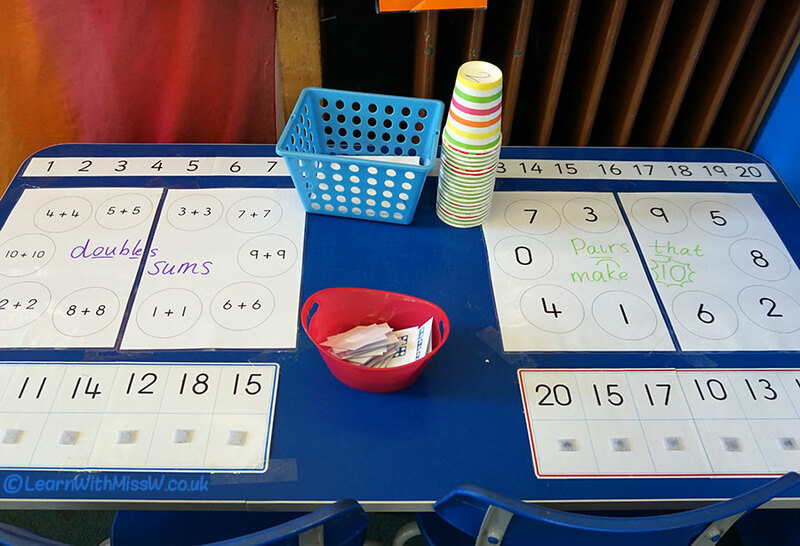 This is now helping them to make sense of new concepts quickly and approach maths with confidence and curiosity.